Vivekananda Kendra raipur organized sanskar varga (Cultural Classes) training program. 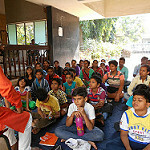 There were session on geet, games and stories part of the program. In this program also delivered the session on the importance of Samskar Varga in current time. There are 7 Samskar Varga are going on in Raipur. There were total 55 youth participated in the training program.